Overview: This course runs every other month. In this five-day course, participants will gain a healthy knowledge of routing cables and individual conductors using their version, or the latest release of Creo assemblies. Participants will learn how to route electrical harnesses, create flattened harnesses for manufacturing, and document harness designs by creating flattened harness drawings that include customized BOM tables and wire list information. Participants will also learn how to create Wiring Block Diagrams and utilize that data for later auto route functions through assemblies. After successfully completing the course, participants will be able to create 3D electrical harnesses, and associated manufacturing deliverables using the latest version of Creo. The 40 hour course covers extensive study and use of Creo Schematics for routing harnesses automatically. Training Track: Design Engine offers a Creo Schematics One Week Workshop as a part of a cabling track. Design Engine can also assist in the customization of your company-specific Creo Schematic symbols, so that they correspond correctly with logical references to Creo Parametric connectors. 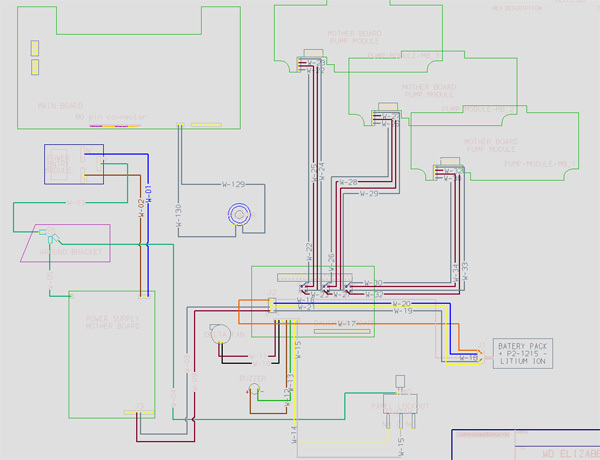 Wiring Diagram using Creo Schematics. Customization: Participants are encourage to bring in harnesses from your work. This course can be customized for specific project tasks or workflow. 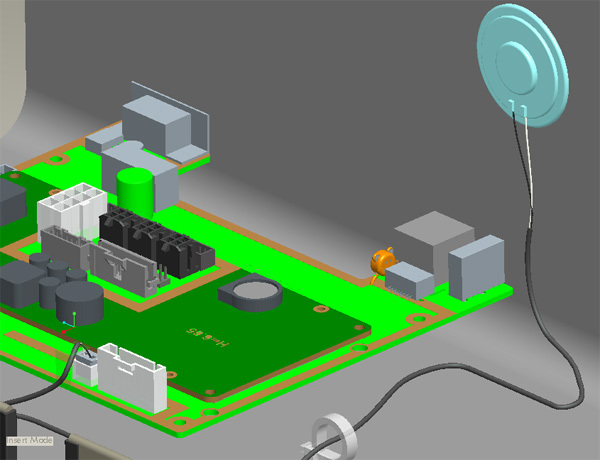 Some manufacturers may use Zuken, or Mentor graphics as opposed to Creo Schematics for example. Others may chose to route bundles as opposed to individual conductors. For contractors looking to become high level harness design consultants, we offer a special two-week cable harness design program. Ask to speak to the instructor at 312.226.8339. Audience: This course is intended for contractors, drafters, mechanical engineers or electrical engineers involved in the management of schematics, electrical cabling and wire harnesses design, or technicians who work within harness design and development teams. Projects: Design Engine has prepared a series of 15 Creo Harness tutorials and Creo Schematics (was RSD) exercises are designed to lead the participants through the cabling design and modification process. These HTML and video tutorials are left with the participants through a password protected web site for a continued Design Engine learning experience. Although Design Engine is prepared to generate custom training materials upon student participant interests or job requirements, this preparation process takes time. We can also help prepare 2d & 3d library parts for your organization. Ten to twenty hours is often required for generating custom HTML tutorials. Call Design Engine to speak to a designer for inquiries at 312.226.8339. Prerequisites: General knowledge of Creo or Creo training and a basic understanding of assemblies and top down design will be helpful for this class but not necessary since top-down is covered within this course. Model 3D Electrical Harnesses with Creo 3.0 Assemblies. Manage import or model connectors and learn to Set up connectors effectively. Participants learn how to prepare connectors, route electrical harnesses through Creo assemblies and separated top down models, create flattened harnesses for manufacturing, and document harness designs by creating flattened harness drawings that include customized BOM tables and wire list information. Participants will gain a firm grasp on large assemblies and top down design, flattened harness with manufacturing details such as wire/conductor lengths. Creating Electrical Harness Assembly Structures. Workflow issues with respect to construction through to major changes to harness assemblies. Manage issues with respect to making changes to harness models. Learn routing wires (conductors) pin to pin w/ multiple connectors and cables in Creo Assembly to create harness designs. Introduction to top down design with respect to cable design and harness design. How to create 3D electrical harnesses using Creo. This includes using 2d schematic diagrams created with Creo Schematics so to pass information into 3D harness designs through Creo Assemblies. How to route electrical harnesses through Creo assemblies and separated top down models, create flattened harnesses for manufacturing, and document harness designs by creating flattened harness drawings that include customized BOM tables and wire list information. Participants will gain a firm grasp on large assemblies and top down design in these workshops. Diagram and Harness Development Process Overview. Learn to use flexible components as opposed to Family tables for adding cable ties. Create Wiring Diagrams using Creo Schematic. Modify existing Creo Schematic diagrams for successful XML export to Creo assemblies for auto routing. Transfer Creo Schematics information into Creo Assemblies and respective drawing tables. Manage harness assembly designs with top-down design. Create Flat Harnesses for Manufacturing and Harness Detail Drawings. Create Electrical Harness Assembly Structures. Route wires and cables in harness designs. Create Flat Harnesses for Manufacturing. Discuss how Creo Schematics integrated with routing cables and auto route work together to enhance efficiency. Discuss AutoCAD workflow for aiding the autorout process for making Creo Assembly. Expound alternate ways to gather usable connectors i.e. IGES/STEP from web site resources. Discuss the difference between wires and conductors. Discuss how to handle modifications to a cable if parts of the cable turn up missing. Discuss with examples how top down design aids in the cable routing process. Review why a designer might want to use top down design relationships made for routing harnesses before submitting to a Team Center, Windchill, Intralink, or other library system. Illustrate and discuss problems with auto route with respect to spool data, schematics and network cables. Discuss solutions workflow with respect to initial construction of cables through to auto routing process. After successfully completing this course, participants will be able to create 3D electrical harnesses and associated manufacturing deliverables using Creo. Discuss the latest numeric harness manufacturing options. Introduction to Creo Cable Harness Design plus making changes utilizing the latest release of Creo. This Creo Cable Harness Design training course is developed for participants who want to become proficient in harness design in just one week. As with all of the Design-Engine classes we help you learn Creo, not read to you from an exercise or a book. In this course we also help design engineers learn how to make changes quickly to set them up for becoming expert faster. As with all Design-Engine classes, participants keep the training material login and password for life.